Today’s passage gets me to consider how God restores. We serve a God of restoration. Consider this—after two days He revives and then on the third day raises up. Does this remind you of anything? Earlier in the passage, it speaks about returning to the Lord. We read that God has torn and struck down. This is something that is done to prune, to grow, to stretch God’s people and produce what is meant—what is better. We read that in doing so we are healed and bound up. The passage continues to say that we are raised up so that “we may live before Him.” I love this. Earlier Hosea speaks about being led astray, not having a knowledge of God, being far from God. Now this passage says that we will live before Him. We go from being far from Him, away from Him altogether, to being right before Him—in His presence! How awesome is that?!? Understand friends, that our God restores. He takes that which is broken and He binds. He takes that which is dirty and cleanses. There will be breaking. There will be pruning. But there is also deliverance. There is also restoration. There is healing. Let us press on. Let us press on to know the Lord. His Word helps us to recognize Him more, to understand Him more. His Spirit reveals and reminds. Press on. When you get desperate you do things you wouldn’t normally. You are more vulnerable. You are more shameless. You are more likely to fall upon your knees. You are more likely to take action. Again and again we see this desperation from so many people in the Bible. Remember the hemorrhaging woman who reached out to touch Jesus? How about the friends who went through the roof to get their friend to see Jesus? Or the blind man who continued to call to Jesus for mercy despite the people around him who told him to quiet down? These people all were desperate. These people were all in need. These people all recognized they could not do it alone. Jesus did not see these people as disruptions. They were each people in need—in need of a Savior. Each person needed help. Each person needed healing. Jesus did not turn them away despite having other things on the agenda. He took time. He gave of Himself. He embraced these people and filled their needs. We each are in desperate need of a Savior and we each find ourselves on our knees in desperation again and again. If we look around, there are also moments when people are in need of help and they are placed before you so that you can be the hands and feet of Christ. Today I ask if you see these people as disruptions or if you keep your hands open and your eyes on Christ? Perhaps these “disruptions” are God’s plan all along. Perhaps at this very moment, you were to do something great for God’s glory, but you saw it as an inconvenience and passed up the opportunity to show someone the love of Jesus. Perhaps. We all can think back to a time when we expected that something would go differently. Even things we have prayed for did not turn out the way that we had imagined in our minds. When I was a teenager, one of the hardest periods of my life was when the healing I expected for my Grandfather did not come. Sometimes God has another plan—a better plan. We cannot always understand it. We cannot necessarily predict it. Honestly speaking, there are moments when we don’t always like it either because we cannot see the bigger picture. Naaman had leprosy. He expected that Elisha would come out to him and wave his hands over the leprosy and call on the name of God to heal him. Naaman expected to stand there and watch Elisha summon the Lord for healing. Instead, Elisha gives him directions via a messenger. He was to wash in the Jordan seven times—the Jordan River, not even the most likely body of water for healing in Naaman’s eyes. Naaman became angry, so angry that he stalked away. There are moments when we get angry. We expected something to turn out differently. We followed the path God directed us to take but it is not like we expected. There’s suffering. There’s hardship. There’s challenges. There’s mountains to climb. It’s not all rainbows and butterflies. It takes work. This is not what we expected. Today, don’t let your expectations cloud you from your focus on God who has something for you that is beyond your expectation. When something doesn’t go the way you expected, trust that He has a better plan. I do not have any skin problems but if I would have a rash or wound, after it healed, my skin would still show some signs of aging. Skin ages and one can look at any department store to find a variety of different lotions claiming to help reduce the signs of aging. But for Naaman, his skin went from the worst possible condition (leprosy) to healthy skin that was like a young child. This healing is another great demonstration that God does not simply fix us, but He makes us new. The skin was not simply fixed. It now was healthy skin like that of a young child. God can make you new as well. Give Him your life and see. There were different offerings given to the Lord including the Grain Offering. The Grain Offering was to show honor to God. Recently when I was reading Leviticus 2, I read about what was involved with the Grain Offering. There was choice flour, olive oil, and frankincense. But there was something else. Something else was added to the Grain Offering. Salt. The salt was used to season the Grain Offering. That might sound strange to us because we think of salt as a seasoning for food that we will eat. Why would a person salt an offering that was going to be given to God? This salt was to remind the people of God’s covenant with them. Salt symbolized preservation. Salt symbolized healing. God offers us preservation and healing. This salt reminded people that God was active in their lives. He was active and he was offering preservation and healing and restoration. Today we are still offered preservation and healing and restoration through Christ. Like salt, God can penetrate our lives and preserve them. He can offer us healing. He can offer us eternal preservation. But have you added the salt? Have you allowed God to penetrate your life? Are you allowing Him to be active in your life? In 2 Kings 5, Naaman, army commander & leper went to Elisha for healing of the leprosy. Verse 11 says he “went away angry.” He thought that things would be different. Elisha did not come out. Elisha told him to go to the Jordan River and wash 7 times when other rivers were considered better. The servants then said if the prophet Elisha would have told Naaman to do “SOME GREAT THING” his response would have been different. Sometimes we come before God with our problems, our hurts, our dissatisfaction, our pain, our troubles– and we think that He will act in a particular way and do “some great thing.” As we know, our thoughts and ways are not like God’s thoughts and ways (Isaiah 55:8). Even so, we can trust in His plan– it is a better plan. It is not some great thing. It is simply amazing, beyond our comprehension. Walk in faith. Trust in Him. He will do more than some great thing. Don’t try to limit God by not allowing Him to move. This book is about taking a walk in faith and trusting God to do the impossible in your life. This book takes you on my journey to Australia, but it also discusses some things that happened before the trip and when I returned back to the States. 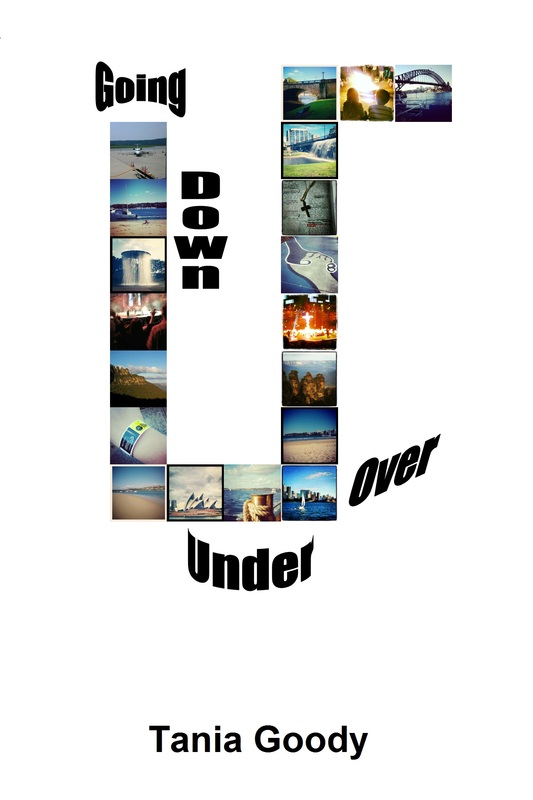 It turned out that the story wasn’t simply about Going Down Under, but about getting Over some things. Sometimes God needs to bring us down to see what is up! This story is all about a walk of faith and encourages others to walk in faith, trusting that He is with you each step of the way. The Twelve Fingerprints eBook is now available at various vendors. This book is not about me. This book is not about my journey so far through life. This book is about my God and some of the fingerprints He allowed to leave a mark on my life. In the end, it all comes down to our relationship with God, and how we react to each fingerprint left on our life is directly related to the person we become. Our reactions to each fingerprint not only show our true colors, but it also is interlinked with our faith. May this book help you to see that every fingerprint can result in a positive reaction if you allow God to have His way in your life. This book was written to cause one to evaluate and question and to seek God and His purpose. We like to complicate things in life. We can make a three word sentence trivial. Interpretations and experiences cause us conflict. We need to see evidence. We are very doubtful, skeptical of anything. We have so many documentaries showing us proof that something is true, and then so many others to counter that theory. We are a society that needs DNA analysis, sheets full of statistics, a handful of witnesses, video footage, photos, and still we are skeptical. With us wanting so many facts and to be shown proof, we often will have battles with doubt. We get into a situation that seems glum. Will God really see me through this? Why is God allowing this to happen? I don’t understand. Show me. I need proof. Is He even there? We become skeptical of what God can do in our lives because we allow the doubt to win. We limit God with our shaky faith. Thomas asked to see Jesus’ wounds to believe, and only then did he believe. The other disciples believed after seeing as well. In Mark 5, Jairus asked Jesus to heal his ailing daughter. Before they could get to his daughter, she passed away. When Jairus was told the news, Jesus said, “Do not be afraid any longer, only believe” (Mark 5:36b NASB). Only believe. At times we need to only believe. It is hard. Things are not always going to be pleasant and everything is not always going to go well. But God has promised us that one day things will be perfect. This is a promise that I cling to, knowing that Jesus has overcome, and therefore so will we. If there is something going on in your life right now and you are doubtful, only believe. Only believe that He is big enough. Only believe that He has overcome. Only believe that things will one day be perfect. Only believe that He loves you so much. Only believe.